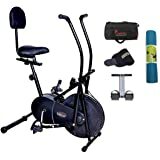 Amazon's Choice for "exercise cycle for weight loss at home"
Sold by HEALTHEX (4.2 out of 5 | 45 ratings) and Fulfilled by Amazon. Gift-wrap available. Installation Available in select PIN codes. 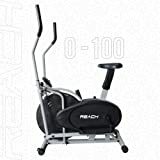 Reach Orbitrek/Orbitrack Exercise Cycle and Cross Trainer | Dual Trainer 2 in 1 Home Fitness Gym Equipment | Scientifically Designed for Complete Body Workout with Minimum Pressure on Knees. 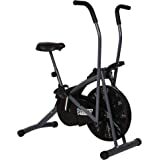 Burn more calories in less time, depending on the intensity. Customize your workout with a tension resistance system. The fully padded seat adjusts to your height to get the most ergonomic fit. 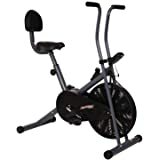 This bike can conveniently be placed in any room in your home. 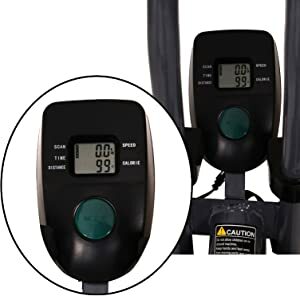 The digital meter can track your workout progress by displaying your time, speed distance, and calories. 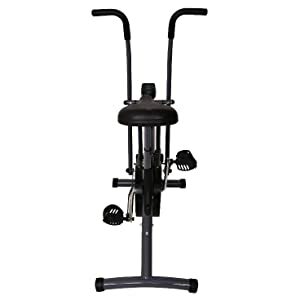 Fitkit 500 Air bike is a user friendly and convenient domestic work out equipment. It occupies low space and is easy to port. Avoiding cycling on the roads or sidewalks is always a better way of preventing accidents. Fitkit 500 Air Bike comes with a back support, and a comfortable saddle for better comfort. 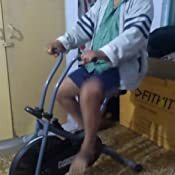 Fitkit 500 Air Bike comes with a comfortable back rest making the equipment usable even for aged people or people with back related problems. Back rest also promotes a healthy body posture while working out. 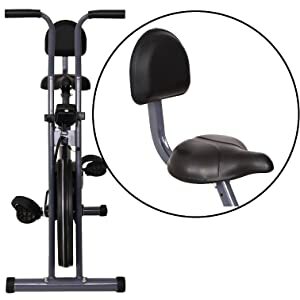 The back rest makes working out comfortable for all users without actually interrupting the exercise. 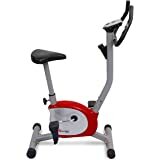 This Fitkit 500 Bike comes with a super comfortable saddle and height adjustable seat, which is a suitable for users of different heights. 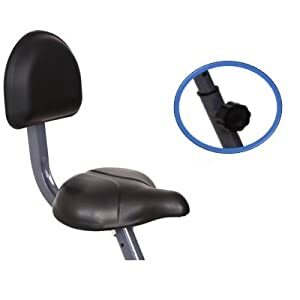 The seat can be adjusted up or down depending on the height of the user by just rotating a knob. This makes the device comfortable for an array of age groups too. 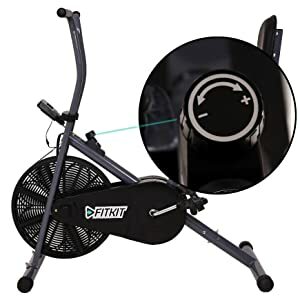 The resistance of the product is easy to increase or decrease, just by turning a knob that is provided on the Fitkit Air Bike. 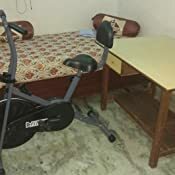 The quality of work out can be changed as per the users, it can be made challenging or easy depending on the requirement of the user by increasing or decreasing the resistance respectively. So, changing the mode of the bike is just the turn of a knob away. This bike also comes with an adjustable handle. The handle can be adjusted up or down according to the height and convenience of the user. 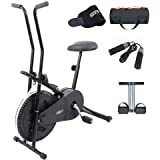 Fitkit 500 offers comfortable workout experience to all age groups (>13) and all body types. The bike comes with a lock system in the pedals to avoid jerking or slippage of the foot from the pedal. The feet need to be fitted in the lock mechanism like a slipper. This helps in avoiding jerking of the feet and gives a smooth motion of the joints and foot. The machine has a monitoring device that displays the time, distance travelled, speed and calories burned. This helps in tracking the progress of one’s workout. The device has a digital LED display which is easily visible and is easy to understand. The product may be good but no installation was provided as advertised. The number that was given as response to other similar questions did not work. Give a review after 3 days of use. Product is too good and also easy to assamble but take 1-2 hours to assemble. There is no unreal noise from air cycle. Amazon delivery is outstanding, before the delivery date. Thanks. The handle can be adjusted and that is what I love about this machine. I work out on it every day. It fits in my budget. It’s hard to find the quality in the given price. I think it is strong and looks classy and is really durable and yet is so reasonable in pricing. Fitkit customer service is great and they came and installed it too. I just loved it and I would recommend it to everyone. Five stars. 2.paddles were not given of appropriate size. Both peddles did not fit to the cycle. 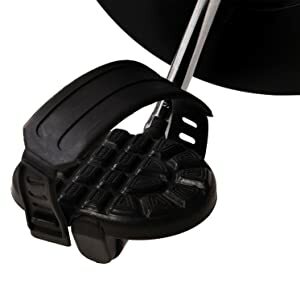 5.0 out of 5 starsComfortable and easy to use. Good product.Bought it for my mother as Physio has advised exercise. Was delivered before time and installation was seemless. Easy to use and comfortable. Quite sturdy. We can also use distance measure. 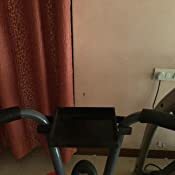 Will recommend this for indoor exercises. 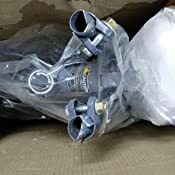 no doubt product is very good i have seen many in market but in this price best product only major issue is there is delay in installation otherwise best product in this price no doubt.I review only after use. Display monitor - Poor hardly any clear data despite, cracked at the time of installation by executive only.